Last month Ohio Gov. John Kasich matched baseball great Joe DiMaggio’s 56-game hitting streak with his own streak of 56 months below the national average for job creation. This month, Kasich’s streak extended to 57, the same number of pickle varieties the H.J. Heinz company located in Pittsburgh, PA made famous in its “57 varieties” advertising campaign. New estimates of Ohio employment for August 2017 were released Friday by the Ohio Department of Jobs and Family Services, showing that current sub-par job growth, including all months between December 2012 and August 2017, has reached 57 consecutive months, according to master job-number cruncher guru George Zeller. 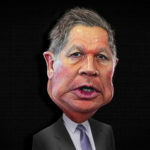 Kasich boasts that state workers are fewer after nearly two terms of his leadership, but fails to understand the lack or elimination of those jobs contribute to his poor performance when compared to national averages and trends. “A counterproductive austerity policy of slashing Government employment during the last several years has prevented Ohio from speeding up its slow and below average growth rate to a vigorous employment recovery that the state badly needs,” Zeller says, pointing to the August data as an illustration of the importance of these jobs.